FASS Adjustable Fuel Pump UNIVERSAL - Lesher Motorsports, Inc. 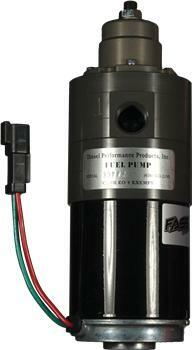 The most versatile High Performance Fuel Pump (pump only) on the market. The FA’s allow the customer to tweak the fuel pressure on the “Fly”. The Boost Compensation Port also gives the pump added/more consistent fuel pressure based on boost referencing from the turbo keeping fuel pressure in line with the needs of the engine. Flow rates from 95 – 260gph and fuel pressure from 0 – 75psi!